The most recent edition of Tech in Asia in Singapore conveys one thing; the startup scene in Asia is full of action. The conference itself has grown from strength to strength. With its formula of themed stages, speed dating and a traditional trade floor, it seems to reflect what startups and investors alike need. Opportunities to network, showcase, pitch and discuss. Here are some of the highlights. On the first day we spent most of the time in the Main Stage area. After the opening keynote we saw LINE CEO Takeshi Idezawa, being interviewed by David Corbin, Director of Content Strategy at Tech in Asia. They zoomed in on LINE’s strategy. Takeshi explained how they approach the development of new products. They set themselves a number of KPIs and when these are met, a product will be further marketed and developed. They look at the organic growth of each of the new products. If it contributes according to preset expectations, the product is kept. But in the case of LINE Mall e.g. they pulled it, even though it reached the #2 spot in Thailand. He confirmed that there is a shift to smartphones and applications. LINE also realise that it might be a bit overwhelming for users to deal with a multitude of different applications, so they are in the process of streamlining their offering. To the question whether he was happy, he answered that he wasn’t although he smilingly admitted that being on the Tech in Asia Main Stage is a good proxy. 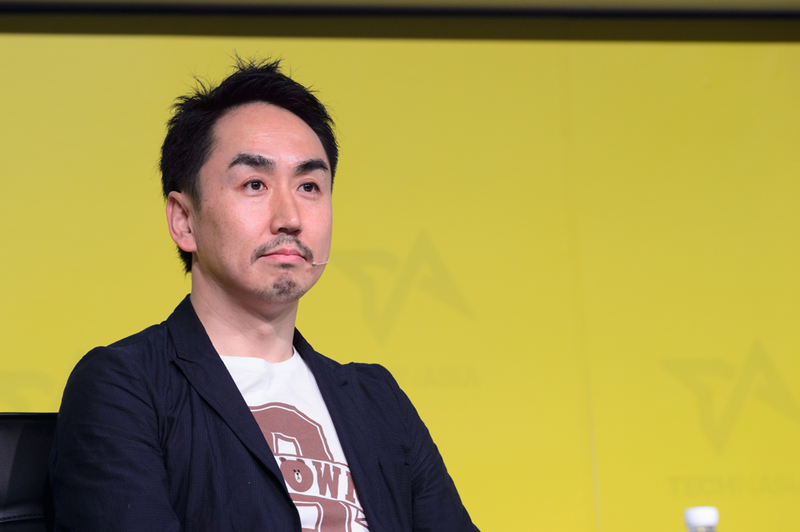 Most important is that Takeshi, like many other speakers later on that day, confirms that consumers are switching from social media to chat applications and that being a player in that field is important. They look for value add that comes out of chat and a.o. claimed that working with Domino’s Pizza led to an increase in revenue by 200% while increasing delivery efficiency by 1.5x. Danielle Levitas, SVP, Research & Marketing Communications, for App Annie presented facts and trends in the mobile applications space. One of the most interesting insights is the as yet untapped potential of the 3rd party Android stores. These stores will surpass the combined revenue of the Apple and Google Play Store by 2017. Other interesting facts are that e-commerce basket size in mobile apps is consistently higher than that on the web. Games revenue are seen to more than double by 2020 and other revenue streams are expected to grow too, such as mobile advertising, e-commerce and the IoT space. The applications that currently drive most revenue are in the area of dating, ride sharing and streaming. The use of messaging, i.e. chat apps, is exploding. App Annie see a typical 1000 actions per user per session in Asia, about double from what happens in the US and Europe and still rising. Chat apps also offer alternative ways to deliver customer service. In addition there is a steady rise of chat bots. The big outliers isn Asia are among its biggest markets: Japan and India. In Japan mobile web still prevails over apps, while in India there is no Brick ‘n’ Click market. In Europe and the UK the division between physical retail, online retail and app-based e-commerce, is seen as more balanced by App Annie. 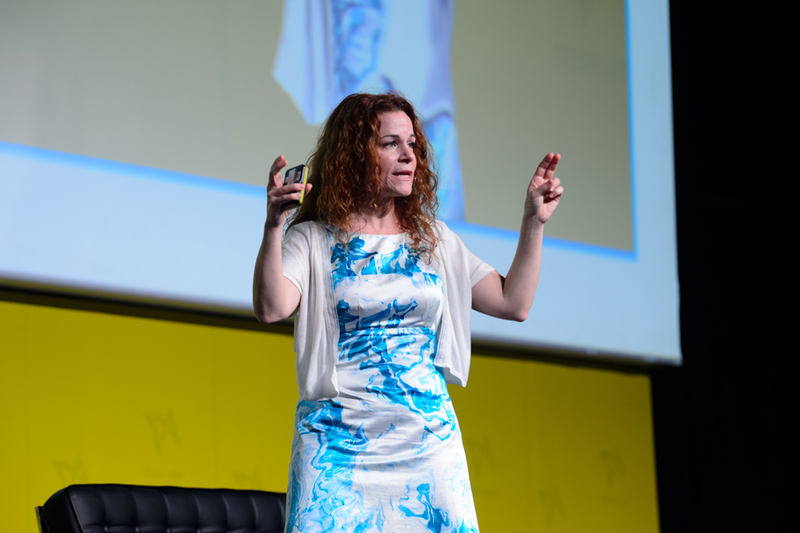 In a short interview with Danielle after the presentation she indicated that App Annie is currently going through a phase where they focus on consolidating the business. They claim to be very pragmatic and will stick to mobile apps, while cautiously exploring areas like interactive TV. 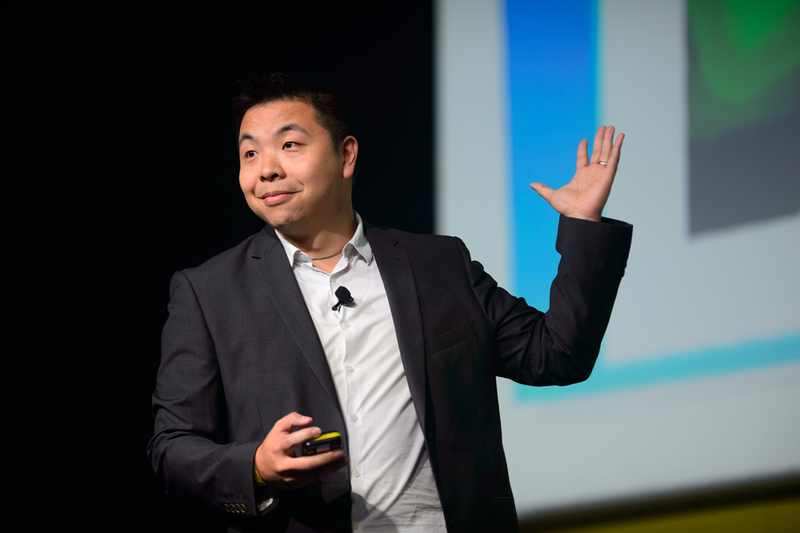 Houzz is the biggest success story you’ve never heard about. Houzz co-founder and CEO Adi Tatarko was supposed to present but was replaced at the last minute by its Asia Pacific Managing Director Jason Chuck. On the Houzz platform you can look up interiors that you like and place products in them from the product database. You can also upload a photo of your own rooms and place products in there. In addition you find experts to discuss your projects with and a community where you can ask questions and get inspiration. Houzz partners with the likes of Ikea, helping them with marketing and sales efforts. It is fascinating to see how Houzz within 7 years went from a startup to a big player in the interior design space, purely on the basis of a platform offering. Whether you’re in the furniture or interior design business or are just someone planning on redecorating your own home, Houzz wants to be your go-to partner. 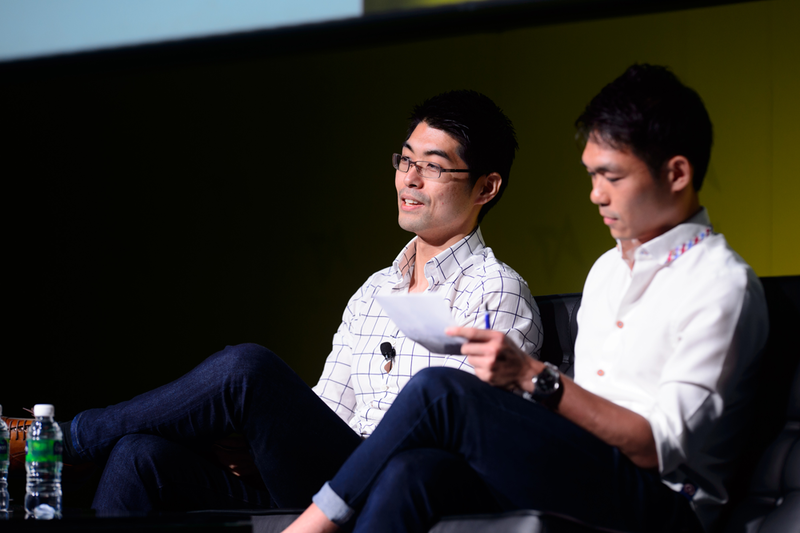 Managing Director of Rakuten Ventures Saemin Ahn, was one of the most anticipated speakers, judging from the hall, which was filled to the brim. This can probably be explained by the fact that a large part of the TiA audience consists of cash starved entrepreneurs, and Saemin and his fund are in the process of doling out close to $300m in cold, hard cash. If you want to picture it, think of a room full of hungry cats staring at a podium with a goldfish bowl on it. The goldfish in question explained how he looks at investments. ‘My main criteria is that I invest in companies that I believe in but also those where I align on goal points.’ Saemin explained how he ended up not investing in one venture because the venture wanted to focus on top line growth while Saemin himself preferred them to focus on per unit economic profitability. He also explained that it is important to provide startups he invest in with the gift of time. You invest and let them run. Asked about which investment he considers a good one he responded that Pocketmath was a good investment, specifically because they managed to grow rapidly and with a very sticky user base. As a counter example he mentioned Viber that might have been maybe a mistake even though they are still the third largest chatting platform in the world after WeChat and WhatsApp, with 230 million MAU. It seemed a good deal when it happened, 2 weeks before the WhatsApp deal was announced, but has since lost its shine as WhatsApp has taken centre stage. When asked what he considers good founders he answered that founders who are trying a 100 times over to be more efficient and effective in any process or user experience have his preference. He explains that startups should try everything in their power before they give up. It is important to try really hard. In the end he says that if you fail as an entrepreneur, your investor fails with you. Being a startup entrepreneur is strenuous activity and it is absolutely important you realise this before you start. Currently Rakuten is considering entering the Indonesian market. 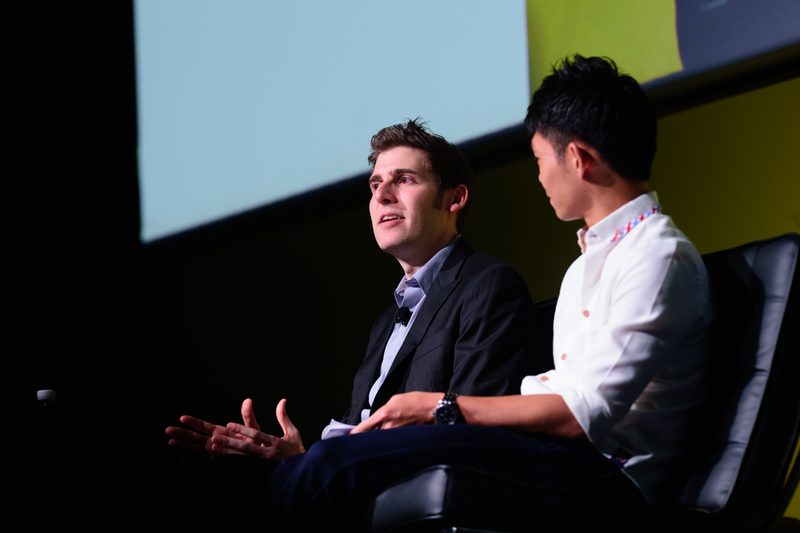 If Saemin was the goldfish then Eduardo Saverin was the whale on stage. The highlight of the 1st day was the fireside chat with Facebook co-founder Eduardo Saverin interviewed by the witty founder of Tech in Asia, Willy Wee. Like you would expect, Eduardo did not give away the crown jewels. (Despite the fact that he can probably buy them twice over.) He remained quite strategic and superficial about his days at Facebook and his current strategy as an investor. Still his opinion is interesting and provides guidance. He runs a fund called B-Capital. It was very interesting to hear what he focuses on when investing in startups and what he considers being important. First and foremost he explains how his move to Singapore took place after he started helping a friend out starting a business in Singapore. He quickly realised that Singapore is a buzzing centre of entrepreneurial activity in Asia and that it has an excellent infrastructure to help businesses being successful. (1) Global businesses for the simple reason that we are becoming more and more global so it is a relevant area. He is interested also in global companies that drive change in the global economy. (2) He likes ventures where he can get involved in a more hands on approach. He explained that the real hard work begins when the investment has been done. He likes to be involved since capital is more of commodity today and the difference comes from involvement in your ventures. (3) He is fascinated by ventures that sit on the intersection of technology and assets, brands and distribution platforms. How can you bring these together in a productive way? Eduardo is fascinated by highly regulated industries. He thinks that they will be very critical to invest in and for entrepreneurs to be active in. When he invests he certainly looks at the team and the people behind the startup idea. He also analyses the technology, the market where the venture will be active and the recurring revenue and sustainable revenue potential. When it comes to the entrepreneurs he says that he should see and feel that they have a real passion for what he or she is doing. But in addition you should be armed with the ability to listen. One question was geared towards how you can assess this passion and how entrepreneurs will react to the strain and stress they will encounter. Eduardo answered that you can never be sure but that you develop an intuition for this. You should definitely invest in bright minds, he said. At the same time he considers mentoring startups and entrepreneurs a part of an investors role. He used ‘The Facebook” as an example here. He jokingly explains that at first, in the print version of the student face book, he didn’t exist at Harvard because he missed the first day photo deadline. Developing an online version took care of that issue. At the same time, the revolutionary idea was to put the profile ownership of each of the students in the hand of the community itself. But the real basic reason for success is not only the community ownership but the fact that they kept it simple at first. From then on, they also continued to listen to the community and improve Facebook with the users’ feedback. This helped to create stickiness and led to the development of the first real identity platform at scale. What is he looking at today, what fascinates him? He looks at ventures that disrupt traditional verticals. Examples are insurance and last mile logistics. Last mile logistics should change as a result of the e-commerce boom, specifically in markets like Indonesia. The degree of difficulty in these markets is not so much about front-end e-commerce, it is much more about the back-end and the logistics. What are the difficulties as an investor? Investors have to say no all the time to amazing entrepreneurs with amazing companies and ideas. You have to wear multiple hats. You become partner, friend, sounding board, and more often than not all of the above. But sometimes you get conflicting ideas when an entrepreneur is taking decisions that you think are not in the best interest of the entrepreneur. As an investor you enter a relationship of trust. You develop a friendship and/or a partnership and you might become a board member. Still as an investor you’re not in control. You should really be enabling others to change the world. Similar to Saemin from Rakuten Ventures, he said that in addition to this, you should take time to understand whether you’re investments are successful or not. What did he not invest in? Eduardo did not invest in Dropbox. He had an opportunity to enter. But at the time he did not step into the venture, which in hindsight he realises may have been a mistake. The final question Willy the interviewer asks is if he would consider starting a business again? Eduardo admits that he wonders about that every day. But the conclusion is that between building something from scratch or enabling entrepreneurs to do that, he thinks he is better in the latter. He doesn’t want to build change himself but wants to continue and invest, mentor and guide entrepreneurs in different fields. Today he has learned as much from entrepreneurs as he has learned during the Facebook startup days and that this is very satisfying.